Now it is no secret that Sandra loves Critters, all critters, big and small……………..with one very small exception………..being spiders. One of the creatures she loves is House Mouse………….not so much running around her house(Sadie the three legged cat took care of that incident) but as in House Mouse stamps. Posted on November 17, 2015, in Card Samples, Felix (Sandra's) Card Samples, Sandra's Challenge Entries and tagged challenges, Copics, House Mouse. Bookmark the permalink. 6 Comments. Such a pretty card! Thanks so much for joining us at House Mouse and Friends Monday Challenge. Good luck! Oh I love it…both the card and your witty post!!! 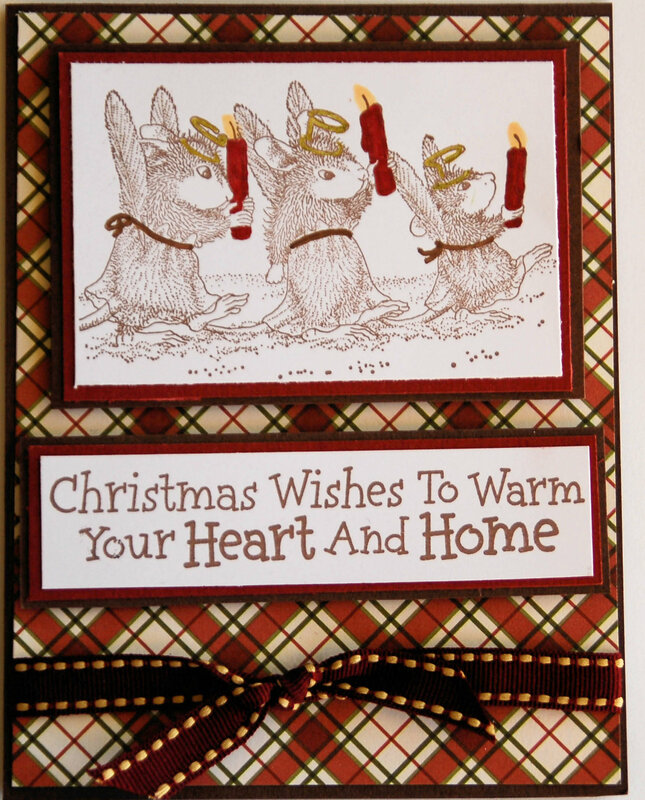 Thanks for sharing you beautiful card with us at House Mouse and Friends!! Adorable cute card clever use of the image & wow that Paid design paper is gorgeous super take on the chall theme. Oh my, Sandra, those Angels are so cute. Love the pretty plaid you chose, and the ribbon is perfect too. Thanks for joining us for the House Mouse and Friends Monday Challenge and sharing your card with us. Well I love critters too. So glad you made this darling meece card! Great plaid paper!!! Thanks for joining us at House Mouse and Friends Monday Challenge. I love it Sandra…the plaid is fabulous…creating a perfect backdrop for this super cute image!! Thanks for playing along with us at House Mouse and Friends Monday Challenge!